In this article we will cover apartment search engines. That means you will get help in finding an apartment in a new location with the help of these search engines. With the internet being around, apartment searching has become so easy. You no longer have to go through the paper and find apartments which match your needs. Whether you are moving to a new country or a city, finding apartments on rent has become easy through the internet. 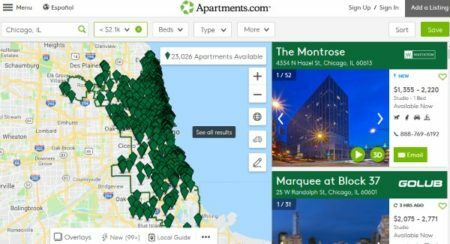 You would find lots of websites listing apartments all over the country. Be it any city, you are sure to find a decent accommodation online. 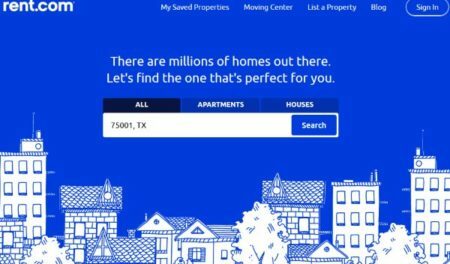 So what do apartment search engines do? 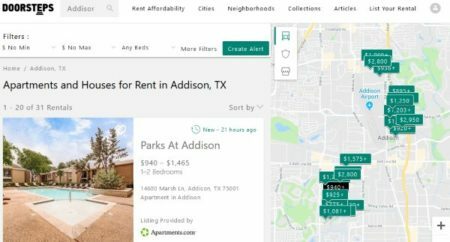 Well like any search engine, apartment search engines find apartment listing from all around the web and show you relevant results. 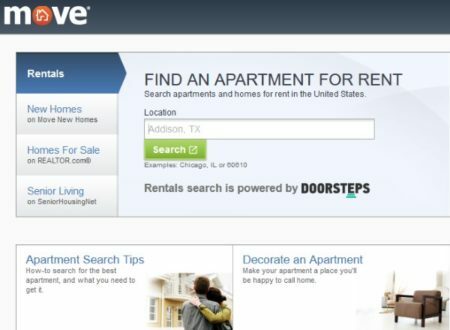 These search engines are dedicated to finding apartments only. So when you make a search, the search engine will look for listings all over the web by realtors, websites, etc. for the location that you are searching for. 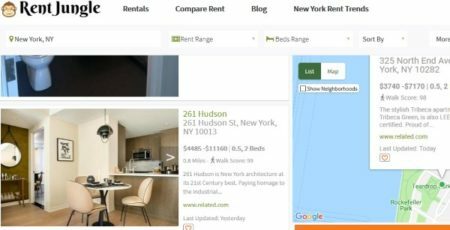 While searching I realized that its difficult to distinguish between the search engines and websites for apartment search. There are 1-2 very good search engines for apartment search which pull off results from multiple websites or realtors. But then the apartment search websites are pretty good as well, with lots of listings to match your budget. So let’s look at these apartment search engines below. Apartments.com is a good search engine to find rental apartments in a city. The search engine has a nice interface and searching for apartments is quite easy. When you start with this website, you will see an interface like the one shown in the screenshot above. You can sign up and create a account with the website to save your searches. At the top of the search box you have options to select from apartments, condos, homes, or town homes. You can select one of the option to make your search more precise. The in the search box select the location where you have to look for an apartment. Then select your rent range and the number of Beds & baths you want in the apartment. Then click the go button. The search result would be displayed as below. The left side of the screen will have a map of the area you entered. Pins for all the apartments available for rent will also be shown on the map in green color. On the right side you will have details of the apartments available for rent with name, address, rent, pictures, etc. The apartment results are gathered from various realtors and the name of the realtor or company is displayed on the right side of the apartment name. You can look through the apartments search result and email the ones that you like for inquiry. The amenities will also be mentioned in the apartment description. Rent Jungle is another nice website to search for apartments to rent in a city. When you open the website you will see an interface like the one shown in the screenshot above. Here in the search box, you can enter the name of the city you would like to rent a apartment in and then click the search button. The search results are displayed as the screenshot below. You can see that the results are divided into two parts. The right side of the screen has a map, which shows the apartment locations. Whereas, the left side of the screen has apartments listed. The search results are collected from various listings of apartments on other websites. The name of the apartment is displayed along with the address, rent amount, amenities, etc. When you click on a apartment listing, it will open in full screen with pictures and details about the apartment. Move is one such search engine which pulls off results from other websites. The search function of the website is powered by doorsteps. The website interface looks like the screenshot above. Here you can enter the city in which you want to search for an apartment. Then press the search button to go ahead with the search. The search result page will look like the screenshot below. In the results page you will have the map visible on the right side with all the rental locations pin pointed on the map along with rent price. The left side of the page lists the apartment names, with addresses and an approximate rent amount. You can click on an apartment name to view more details about it. You can also view pictures of the property. The apartment search results are collected from different sources one of them being apartments.com. 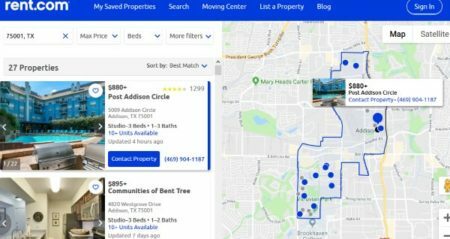 Rent.com is a website for apartment search and it showed by far the most results for a location as compared to others. The website interface is user friendly and easy to navigate. When you open the website you can select what kind of rental property you are looking for like apartment or house. Then enter in the location you want to search. You can also enter the zip code of the location for search purpose. When you search the results will be displayed in the manner shown in the screenshot below. On this page you can see that right side of the page is a map with all the rental properties listed on it with pins. On the left side is the properties that the website searched. The properties are listed with there names, address, approximate rent, etc. You can contact the property for further inquiry. When you click on a property name, it will open up in full screen and bring up details about the property along with pictures. 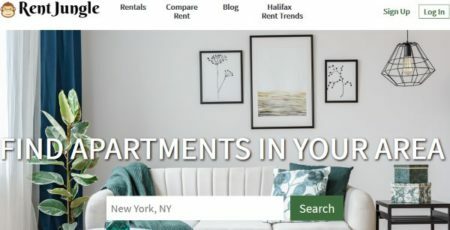 These are some apartment search engines I was able to find among so many apartment rental websites. Almost all of them offer useful information to help you pick the right property which suits your need. Check them out.